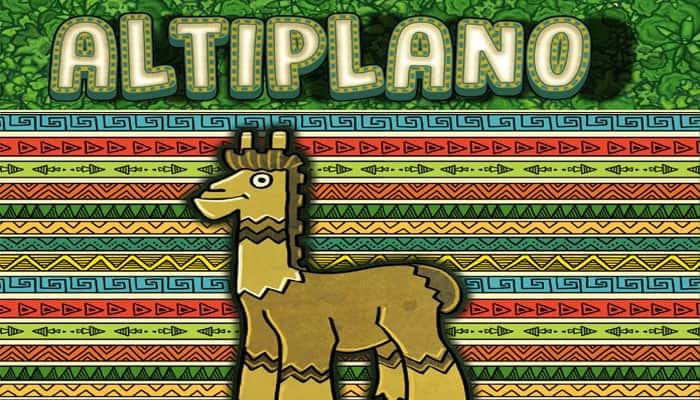 The inhabitants thrive by fishing in Lake Titicaca, mining ore, breeding alpacas, and trading goods that they produce from these resources. But the resources are limited and will eventually run out, so you'll need to build new production facilities and find new sources of income, like cacao. Determine how many goods and carts to use, based on the number of players (see chart below) , returning any extras to the box. Shuffle the 16 order cards , then randomly remove 6 cards (with 2-3 players) or 4 cards (with 4-5 players) from the game. Return them to the box unseen. Place the 7 location tiles in random order so that each location is adjacent to 2 others and they all form a circle. This is the plateau. Put all 36 food tiles and 50 coins in the center of the plateau (i.e., between all of the location tiles). This is the supply. When the tiles or cards of a given type are depleted, there are no more. In principle, actions that let you acquire tiles or cards may still be carried out even if they are depleted (although this often wouldn't make much sense). Coins, however, are unlimited - if the coin supply is depleted, use a suitable substitute. Seperate the remaining extensions into 4 face-down stacks, based on their backs ( A , B , C , or D ), then shuffle each stack. Arrange the stacks to form a single face-down stack: D stack on the bottom, then C stack on top of that, B stack on top of that, and A stack on the top. Place the extension strip on the table, then reveal the top 5 extensions from the stack and position them in the 5 slots to the right of the extension strip, 1 per slot. 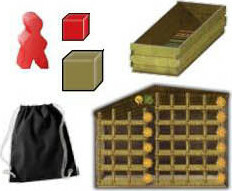 Each player chooses a color and receives the following personal items: 1 action board, 1 warehouse, 1 player pawn, 1 road marker, 1 container, 1 cart (from the village) , and 1 cloth bag. Each player should put their road marker on the top space of the road, and their cart on the applicable upper cart space of their action board. Give the start player marker to the youngest player. Shuffle the 7 role tiles face down, then deal 1 at random to each player, face up. 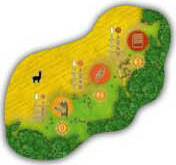 Each player should take from the center the goods tiles, food tiles, and coins indicated on their role tile. Goods tiles and food tiles go in the cloth bag, while coins go next to your action board. Once all players are familiar with the game, we recommend that you choose your assigned roles. To do this, lay the role tiles out face up. 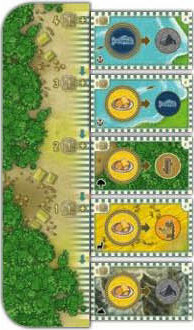 Beginning with the last player in turn order and continuing counter-clockwise (i.e, start player chooses last) , each player chooses 1 role tile. Any player may check at any time what orders, boats, and houses currently are on the locations or with the other players. It is also allowed to count how many goods tiles are left in the supply and how many extensions are still in the stack (but without revealing the extensions or changing their order). Any player may check at any time the goods that are in their own bag or container. When the end of the game has been triggered - either because 1 location has been emptied or there are not enough extensions remaining to fully refill the extension strip - you will finish the round, then play 1 final round. The player who has the most points at the end of the game wins! All players carry out this phase simultaneously. Before you draw any tiles from your bag, you may retrieve previously placed tiles from your action spaces (either on your action board, role tile, or extensions) and put them back onto unoccupied planning spaces. You can also retrieve unspent coins from your extensions. Important: You may never retrieve tiles from your warehouse or from orders and put them back onto planning spaces! Your Bag Draw random tiles from your bag and put them onto the planning spaces of your action board. You will always draw tiles equal to the number of unoccupied planning spaces you have available. At the beginning of the game, you can occupy planning spaces 1-4 only (the other planning spaces become available as you construct roads). Example A: To begin his turn, Chidi has 4 unoccupied planning spaces available. First, he decides to retrieve 1 fish tile from the harbor, putting it onto planning space 1. Then he draws 3 random tiles from his bag and puts them onto planning spaces 2- 4. If you don't have enough tiles left in your bag for all unoccupied planning spaces you have available, draw the remaining tiles, then empty the contents of your container back into your bag . After this, draw the rest of the tiles you need. If there are not enough tiles in your bag after you have emptied your container, then some of your available planning spaces will be unoccupied for this round. You may now place the tiles from your planning spaces onto unoccupied action spaces (either on your action board, role tile, or extensions). Each location depicts which tile or tiles must be placed on its action spaces in order to take the corresponding action. The only restriction is that you cannot place a tile at a location if you could never use that tile there. You are not required to place all the tiles from your planning spaces - however, this means that you would draw fewer tiles in the following round. The basic actions, which are available to all players, are those on the action boards. At most locations, there are several different ways to use the tiles you place there. But the number of action spaces at a location is limited to 2 or 3, and only 1 tile can be placed on each action space, so you often won't be able to carry out different actions at a location in the same round. Example B: Asha could produce 1 wool at the farm if she places 1 alpaca and 1 food on that action space. She could place just 1 alpaca to produce 1 food instead. 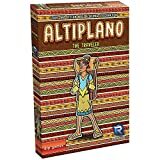 In fact, because Asha has 2 alpacas available on her planning spaces this turn, she could place 2 alpacas at the farm, which would allow her to produce 2 food in a single action. Important: During this phase, you may not relocate tiles that were placed on your action spaces in a previous round. Any tile that you put on an action space will remain there, even between rounds, until you either use the corresponding action (in the actions phase) or retrieve the tile (at the start of the drawing phase). Certain market extensions require that you place coins instead of tiles. 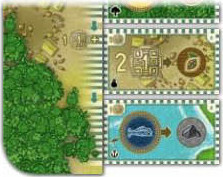 For these extensions, you must place the required coins during the planning phase, like you would any other tiles. 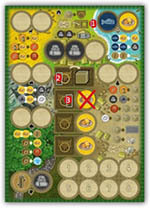 When the start player is satisfied with the placement of their tiles, they declare that their planning is complete. Each other player, in turn order, then does the same when they are ready. Once you have declared your planning complete, you may not relocate your tiles. In this phase, players take actions in turn order. 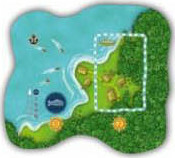 Beginning with the start player, each player takes 1 action . Players continue to take actions this way, 1 at a time, until they choose to pass on their turn. Once a player has passed, they can no longer take further actions in the current round (though other players will continue). You must meet the requirements of the action (usually, having placed the required tile or tiles on the action space). 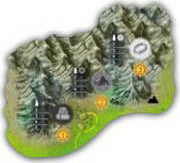 Your player pawn must be at the corresponding location tile in the plateau. It is not mandatory to take all actions that are available to you in a given round. Even if you placed tiles during the planning phase that would allow you to take an action, you can leave them for now - perhaps to take the action in a later round, or perhaps to retrieve those tiles and use them elsewhere. Pawn Before and/or after each of your actions, you may move your player pawn around the plateau, in either direction. (Before your very first action in the game, place your player pawn on any location tile of your choice). You can move either by foot or by cart. Moving by Foot: In order to move, you may move 1 step by using 1 food from a movement action space. You may do this multiple times, using 1 food for each step. Each step you move must be to an adjacent location. Moving by Cart: Each player begins the game with 1 cart (but may buy more). You can use each cart once per round. A cart allows your player pawn to move up to 3 steps around the plateau (instead of 1) , in either direction. When you use a cart, slide it to the right to indicate that it cannot be used again this round. You can use your first cart each round for free, but for each subsequent cart you use in a round, you must have 1 food on your movement action spaces. Example C: Valerie wants to take actions at 3 different locations this round. She has 1 cart, and placed 1 food on a movement action space. On her first turn, Valerie takes an action at the harbor. On her second turn, she uses her cart to move to the road (3 steps away) and take an action. 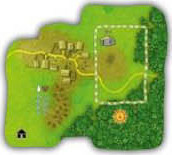 For her third turn, Valerie uses the food to move by foot from the road to the village (1 step away) and take another action there. Put all tiles you are removing to take an action, along with any tiles gained by taking the action, into your container. The same applies to food tiles used for movement. (Remember: Tiles in your container will remain there until you need to draw from your bag and it is empty). When you gain a new tile, take it from the corresponding location tile. Important: Unlike many games in which you sell or otherwise give up resources, in this game all goods and food tiles always remain in your possession. Only coins are spent. Coins are handled differently than goods and food tiles. First, coins are always spent and returned to the supply when used. Second, coins are kept next to your action board. This means that coins do not go into your bag or container , and you do not have to put them onto planning spaces to use them. (Remember: On market extensions, you do have to place the required coins during the planning phase in order to take the action during the actions phase). When all players have passed (either voluntarily or because there are no more actions available to them) , proceed to the cleanup phase. 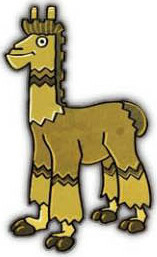 Produce food: Use 1 or more alpacas to gain 1 food per alpaca from the supply. Produce wool: Use 1 alpaca and 1 food to gain 1 wool from the farm. Produce cloth: Use 1 wool and 1 food to gain 1 cloth from the farm. Produce wood: Use 2 food to gain 1 wood. Trade cacao: Use 1 or more cacao to gain 1 food, 1 cloth, or 1 glass per cacao. Produce stone: Use 2 food to gain 1 stone. Produce silver: Use 1 ore and 1 food to gain 1 silver. Produce food: Use 1 fish and 1 food to gain 1 food. Trade fish: Use 2 fish to gain 1 stone. Build a boat: Use 2 wood to take 1 boat card of your choice from the stack at the harbor. You immediately gain the good shown on the boat card (one time only). Put the boat face up next to your action board. Build a house: Use 2 stone to take 1 house card of your choice from the stack at the village. Put the house card face up next to your action board. Store goods: Move 1 or more goods (not food) from this location to store them in your warehouse, following the storage rules. Buy a cart: Spend 1 coin to take 1 cart from the village and put it next to a movement action space - it is available to you for the rest of the game. You may buy only 1 cart per round and may have a maximum of 4 carts. Sell goods: Use 1 or more goods to gain coins equal to their prices (listed on your action board). Goods without a listed price cannot be sold. Buy an extension: Take any 1 available extension by paying its price in coins. The price is the extension's inherent cost (printed on the extension itself) plus the additional cost indicated by the slot it occupies at the extension strip. Then adjoin the extension to the corresponding location of your action board. You may buy only 1 extension per round. Important: You cannot buy an extension if you already have an identical extension or if its action is the same action provided by your role tile. Acquire an order: Spend 1 coin to take 1 order card of your choice from the stack at the market. Put the order card face up next to your action board. Important: You cannot have more than 1 unfulfilled order at a time. You may acquire another order only when you have completed your current order. Deliver goods: Move 1 or more goods from this location to empty spaces on your unfulfilled order card. You do not have to deliver all of the required goods at once. If you delivered the final required good, gain 1 corn from the road and immediately store it in your warehouse. The delivered goods remain on the order card. Follow these steps to prepare for the next round of play. Pass start player. 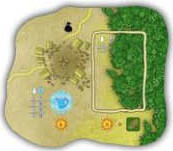 The current start player passes the start player marker to the next player in clockwise order. Reset carts. All carts that were used this round are moved back to the left. Refill extension strip. If 1 or more extensions were bought this round, slide all extensions downward to fill in any gaps. If no extensions were bought, discard the extension at the bottom, removing it from the game. In either case, refill the extension strip with new extensions from the stack. When you store goods in your warehouse, either by taking the "store goods" action or due to gaining corn, you must follow the rules below. Fill from bottom to top. When you start a new row, it must be the lowest row available in the left depot (or the right depot if the left depot 's rows have all been started). Fill each row left to right. In each row, start with the leftmost space and work to the right, with each new tile filling the next available space - 1 tile per space. Only 1 goods type per row. The first tile in a row determines the only type of goods you can store in that row. (Corn is the only exception to this rule). Only 1 incomplete row per goods type. You cannot start a new row for a type of goods if you still have an incomplete row of that type. You must complete the existing row first. No food! Food tiles can never be stored in the warehouse. Must be stored immediately. You always have to store corn as soon as you gain it (unless you have the extension allowing you to put corn into temporary storage). Corn can be a substitute. You can add corn to rows that already have other goods. This allows you to complete rows with a combination of goods and corn. Corn rows take priority. If you have a row that is only corn, then that is the only row in which you can store corn until the row is completed. Example D: Tristan currently has 2 fish in row 1, and 1 stone and 1 corn in row 2. Now he wants to move 1 wool and 2 stone from the village action spaces to his warehouse. First, Tristan stores 1 stone, completing row 2 (this completed row will be worth 3 points at the end of the game). Then he starts row 3 with the wool and starts row 4 with the other stone. Any 1 location tile is depleted of all items (tiles, cards, and/or carts) that were on it. Not enough extensions remain to completely refill the slots of the extension strip. When this occurs, finish the current round and then play 1 more final round. After the final round, proceed to final scoring. As you evaluate each scoring category, note your score on the included scorepad. 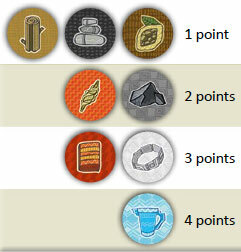 For each goods tile you have, score points according to the values below. Goods in your warehouse are included, but goods on orders are not. Score 2 points for each boat card you have. Score 4 points for each house card you have. In addition, for each type of goods listed on a house card, score 1 bonus point for each goods tile of that type (not on orders). Score the listed points for each of your fulfilled orders. Score the listed points for each completed row in your warehouse. (Optional) Score points for each mission card that you successfully completed. After all scoring is complete, the player who accumulated the highest point total is declared the winner! In the case of a tie, the tied player with the most coins remaining wins.